Saturday, April 13, 2019 9:00-11:00 a.m.
Eugene H. Long, age 69, of Trenton, died Monday, February 18, 2019 at HSHS St. Elizabeth’s Hospital in O’Fallon, and his wife, Carol J. Long, age 70, of Trenton, died Monday, March 18, 2019 at Barnes-Jewish Hospital in St. Louis. Eugene was born January 25, 1950 in E. St. Louis, a son of the late Betty, nee Howerton, and Howard Harding Long; and Carol was born February 17, 1949 in E. St. Louis, IL, a daughter of the late Anthony Lloyd and Doris Mae, nee Goodwin, Jarvis. In addition to their parents, they were preceded in death by Carol's sister Catherine Mae Marzullo; Eugene's siblings, Donna Markowski and Leonard Copeland; and their nephew Jeffrey Hoffman. Surviving are Eugene’s stepfather, Elmer Copeland; Carol's son and Eugene's stepson, Marc A. Jarvis; their grandchildren, Nova and Payge Jarvis; Carol's siblings Mary L. (Lonnie) Hoffman of Breese, Anthony L. (Debbie) Jarvis, Jr. of Houston, MO, Elizabeth A. Reynolds of St. Ann, MO, and Frances M. Smith of Collinsville; Eugene's siblings Bonnie (Timothy) Moyer of Troy, IL, Judy (Michael) Lindhorst of Columbia, IL, Denise (Raymond) Doyle of St. Charles, MO, and Steve (Debbie) Copeland of Eureka, MO; their brother-in-law Andrew Marzullo of Torrence, CA; and several nieces, nephews, great-nieces and great-nephews. Eugene was a veteran of the United States Marine Corps, United States Navy, and United States Army Reserve, and a self-employed handyman. Carol retired from Southwestern Bell as a senior records clerk and was a lifetime member of AT&T's Pioneer Organization. Eugene enjoyed collecting wartime memorabilia, Carol enjoyed playing bingo, and they both enjoyed spending time with family members. 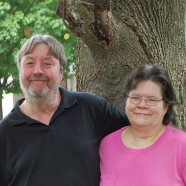 Memorial Service for Eugene and Carol will be Saturday, April 13, 2019 at 11:00 a.m. at Moss Funeral Home in Trenton with Deacon Linus Klostermann officiating. Visitation will be Saturday, April 13, 2019 from 9:00-11:00 a.m. at Moss Funeral Home in Trenton. Memorials may be made to American Cancer Society, American Heart Association, and Shriners Hospitals for Children, or donor’s choice and will be received at the funeral home.